Ryan getting ready to board down the ridge as the snow from storm two starts coming in. 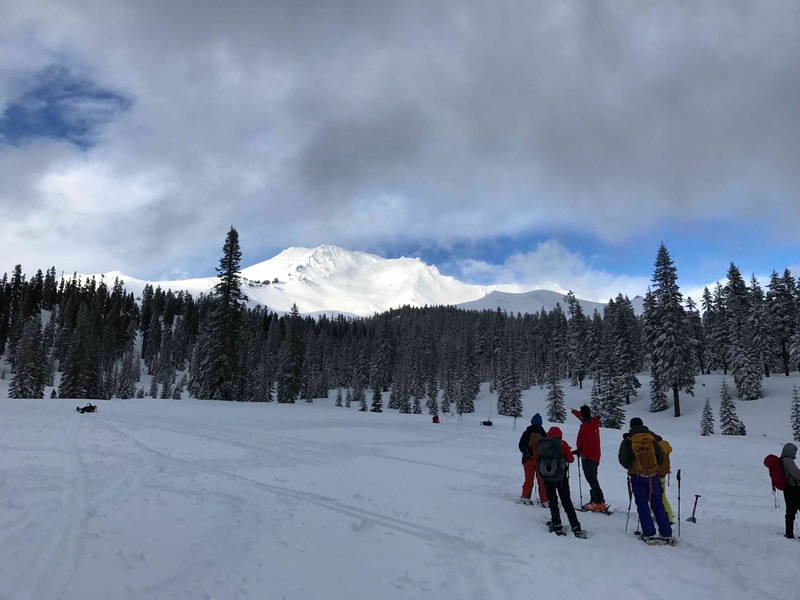 After climbing Shasta my third time and attempting some other well trafficked peaks like Lassen and Round Top last year I started broadening my scope for mountaineering. Up to this point I was only going out into the mountains on days with Low Avalanche risk and to places pretty close to Avalanche centers. However, I like things deep in the backcountry, wild and untouched. I needed to know how to predict snow conditions and avalanche risk. It was time to take an Avalanche Level I course. There are two standards AIARE and AAA both of which are equatable and three levels I, II and III. Level I which I took was basically about how to companion rescue, understanding avalanche causes, how to read an avalanche report and how to apply / gather more information both when planning your trip and in the field. By the end of the course you should feel confident in making a Go or No Go decision. Level II and III get into a lot more of the technical aspects of snow like crystal formation, etc. 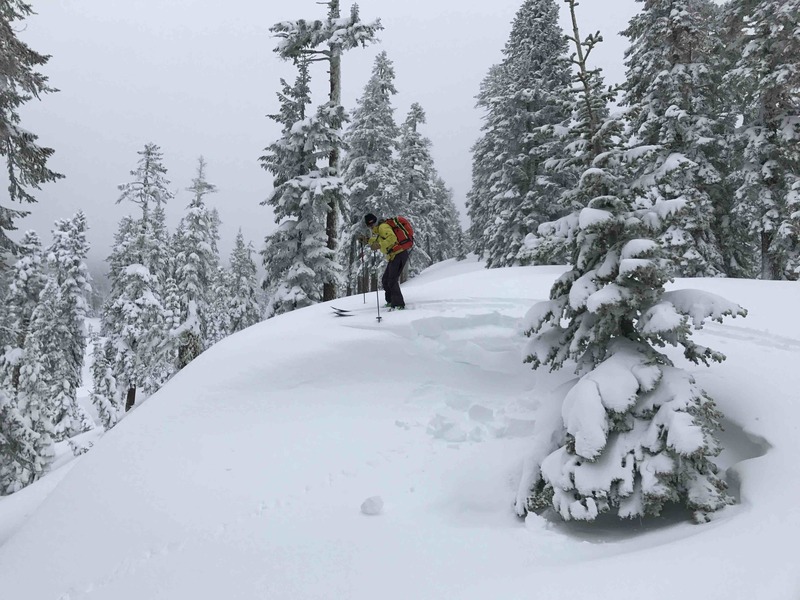 You can find three avalanche centers in the Sierra via avalanche.org: Sierra Avalanche Center, Shasta Avalanche Center and Eastern Sierra Avalanche Center (least staffed). Each is a great resource for finding avalanche courses in the local area. A brief view of Mt. Shasta between cloud cover on day one. 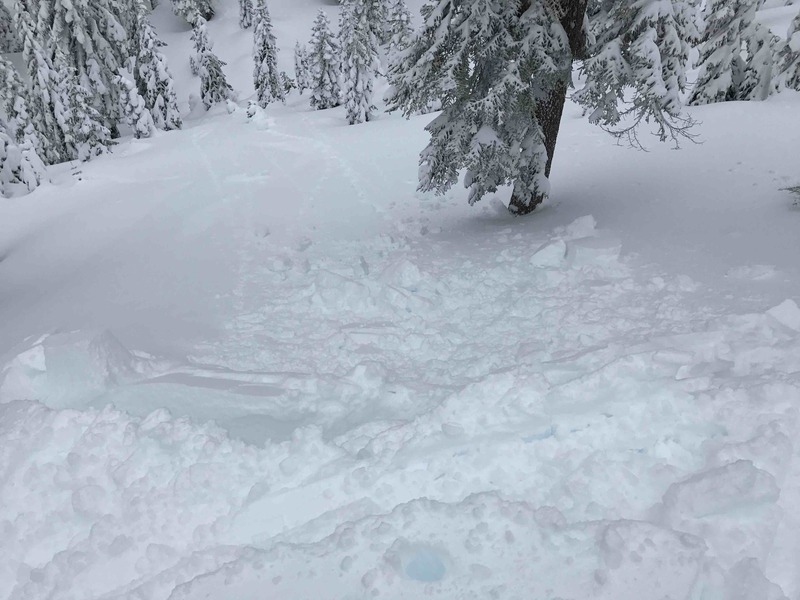 Last year I went to this two part Avalanche primer by the Shasta Avalanche Center guys up at Mt. Shasta (Avalanche Primer + Beacon Clinic). On Friday night they talked about Avalanche Problems and on Sat. morning they held a companion rescue and practice. This was essentially what I learned about in Day 1 of the Level I class. As I’ve found with most outdoor recreation classes, it was really helpful to know some things going into the course so you can ask any lingering questions and remove doubt from your judgement. I recommend at least skimming through some online information from an avalanche center or reading your Freedom of the Hills book. After practicing companion rescue we buried Ryan and poked him with our probes so we could feel what a person felt like. On the second day I learned a lot more about field observations of what is good and what is dangerous given certain avalanche levels. It was super useful, but it wasn’t taught in the most systematic way of X means Y. I think this is because reading avalanche danger is a combinations of many factors which can mean different things in different snow pack, slope, weather, etc. That is why it is so important to gather a lot of data so you can make a reasonable and safe decision. Eventually as this nuance discussed more you start to gain confidence in your decision making. The digging of a pit for block tests in the afternoon was great for understanding how to take observations, what failure in certain cases means and understanding snow density changes. One of the snow pits we dug. We are evaluating the varying density layers in the snow. Lucky for me we went up to Shasta in the middle of storm. 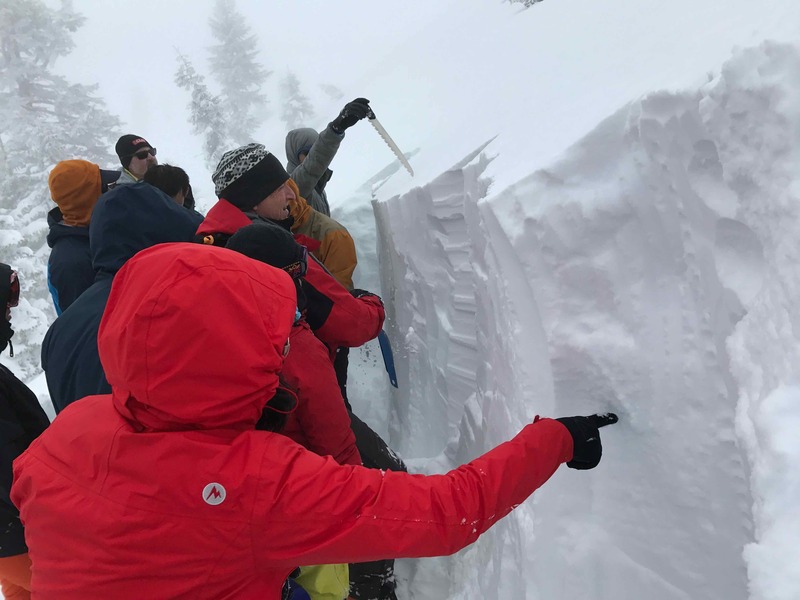 Avalanche danger went from Considerable on Sunday to High on Monday so there was a lot to talk about. Even in High conditions which I figured was a no-go they explained that 25 degree or less slope is unlikely to slide so as long as it isn’t attached to anything up high at the magic angle we could still be safe in the backcountry. 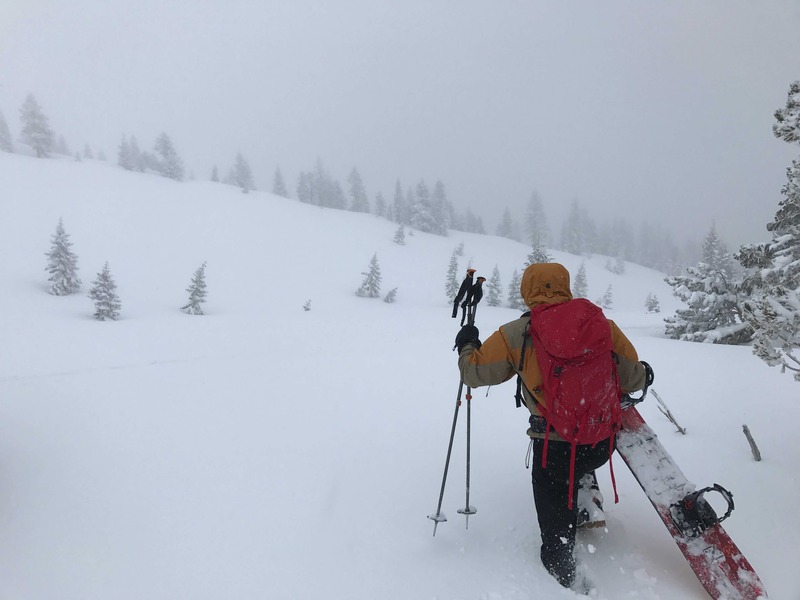 The snow was amazing, the visibility was…okay and we get a lot of great field observations as we gained Green Butte Ridge from Bunny Flat. The instructors broke off cornices by jumping on them and started a storm slab avalanche on ‘micro terrain’. 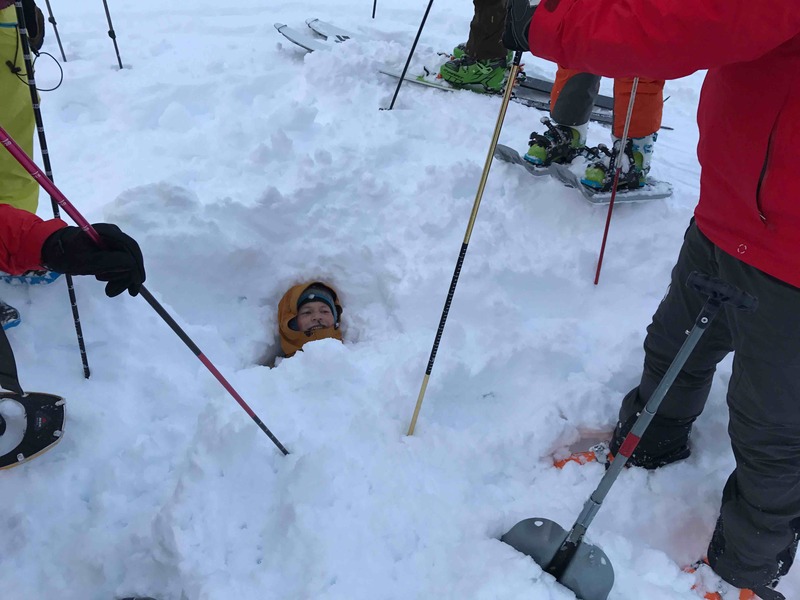 We dug a pit to see how the recent 12+ inches of snow changed the block tests and discussed how pit differed from the one on a different aspect and 24 hours earlier. Our instructor Tim jumping on a cornice on ‘micro terrain’ to see how easily it would slide. 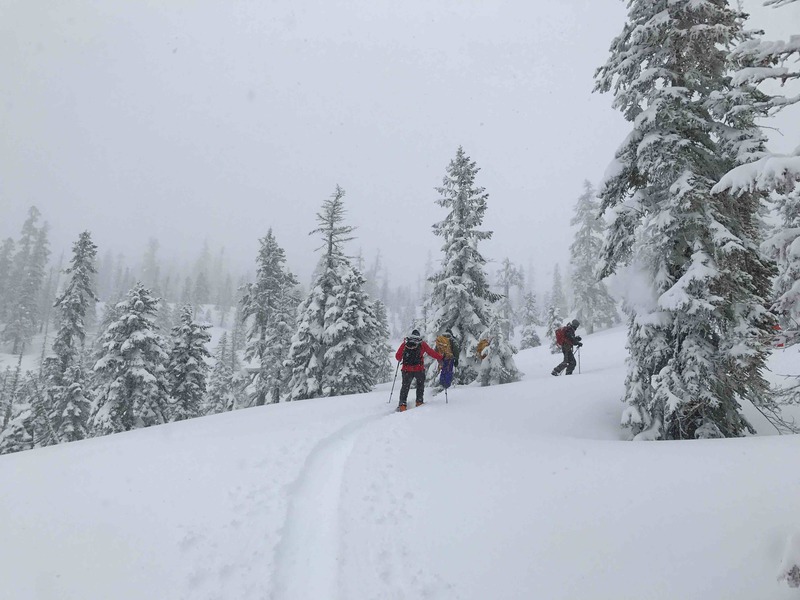 Then to top everything off we finished our tour with a decent through heavy powder through the trees to the trailhead. I’ve only skied in California and the Midwest. After five years of drought and frequent ice crusts all over Tahoe, this was the best snow I’ve ever skied. It was awesome. Touring up through the snow. Did I Get What I Wanted Out of It? Yes. I was unsure at Day 2, but after Day 3 I feel confident that I can make good decisions around avalanche danger. I can find skiable terrain and understand risks enough to go out on days with higher risk than Low. The class from SWS wasn’t quite as systematic or rigorous as I would have liked, but that is sort of normal for these types of classes. Also, Shasta was a great training ground with a lot of different aspects and slope, similar to mountain objectives I will be pursuing. This micro-terrain ‘went’ after jumping on the edge but not far since its not steep below it. You can sort of see some of the blocks.